This question is on finding the line of symmetry. How many of such lines does this five-pointed star have? When we fold the star along this line, both sides of the star is symmetrical. Next, we observe the same thing when this star is folded along this line. 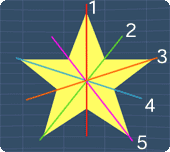 ... and finally, it is the same here as well..
From Step 1 to Step 5, we can see that this star has 5 lines of symmetry.